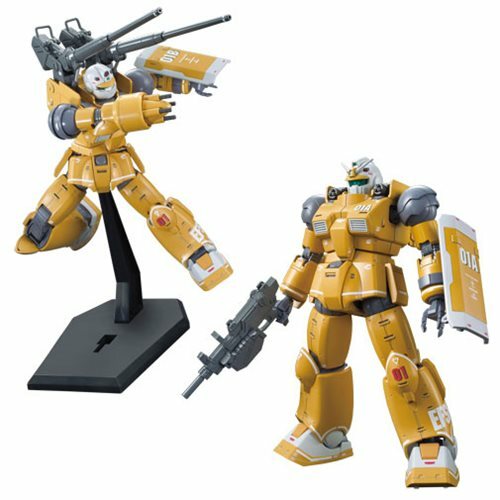 This Gundam: The Origin Movie Guncannon Mobility/Firepower Test Type High Grade 1:144 Scale Model Kit stands about 5-inches tall and gives you the ability to create either one of two types of Mobile Suit. Choose between assembling the Mobility Test Type or the Firepower Test Type! A variety of weapons is included, and they are interchangeable with the HG Guncannon (Iron Cavalry Squadron) (sold separately). There are also marking decals designed by Hajime Katoki! With a wide range of movement, which is a feature of the The Origin series, this awesome model kit is capable of assuming a wide variety of poses. The set includes an MS machine gun, rifle, normal hand (left and right), gun wielding hand, Mobility Test Type head and forearm (right), Mobility Test Type shoulder-mounted Gatling gun (left and right), Firepower Test Type head and forearm, Firepower Test Type shoulder-mounted heavy caliber cannon (left and right), BA-1 display stand, 9 Runners, marking sticker, and instruction manual. Ages 15 and up.